The Education Department has served notices to 699 parents in Mysuru district asking them to send their children to school, failing which cases will be booked against them under the Right to Education Act. Similarly, the department is planning to send out more such notices in the next few days in a bid to reduce the number of school dropouts in the district. Over 5,921 children have been identified as school dropouts in Mysuru district in 2014-15, 3,220 boys and 2,701 girls. Mysuru North stands ranks first in the list of dropouts, followed by Nanjangud (898), Hunsur (771), and H.D. Kote (741). Mysuru Rural accounts for 673 dropouts, Periyapatna (453), T. Narsipur (452), and K.R. Nagar (297). Repeated appeals by the Education Department to parents to send back their children to school had failed to yield any result. The government has made compulsory education for children in aged 6 to 14 and has decided not to fail any student till the ninth grade in a bid to encourage them to pursue education. The department wonders why there dropouts when the government was providing facilities such as midday meals, milk, textbooks, and learning materials to students. An informal survey by the department points out that many parents particularly where Scheduled Castes, Scheduled Tribes and minorities were residing, were yet to realise the importance of educating their children. Chandra Patil, deputy project coordinator, Sarva Shikshana Abhiyana, Mysuru district, said the government had appointed attendance authority at the hobli-level. Mr. Patil said that of the 5,921 dropouts, the Education Department had brought back 2,855 children, including 1,606 boys and 1,249 girls, this year. He said no parent had the right to deprive their children of basic education and it was every child’s fundamental right. This entry was posted in RTE News on December 7, 2014 by vidyut. 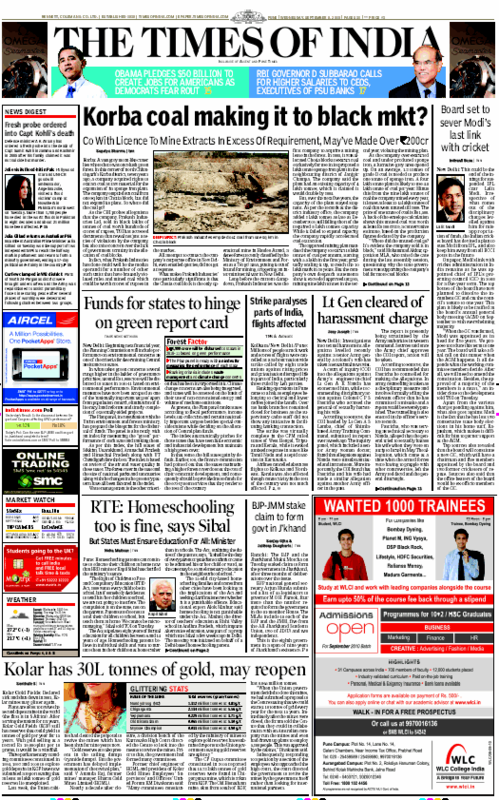 In an alarming development for alternative schoolers hinging their hopes on the interpreted ambiguity of the RTE Act, the Delhi High Court has today termed the withdraw of a 13 year old girl who was not doing well in school as a “criminal offence” – citing the RTE act which makes it mandatory for children between the ages 6 and 14 to be enrolled in school. The child, who is in the custody of the mother after her separation from her father is noted to be in poor health and has studied only till the second class. The child’s father filed the complaint against the mother for removing the child from school. A health examination has been ordered for the child before the next hearing on the 29th. While it is indeed possible that the mother was guilty of abuse or neglect, there is no mention of any reasons provided by the mother for the withdrawal of the child from school – legitimate or otherwise. This is a worrying development for homeschoolers and particularly homeschoolers with divorced or separated parents where the parent without custody could force the end of homeschooling by approaching the court. What is even more alarming is the complete absence of the interest of the child. A 13 year old child who has studied only till the second class is a clear indication that for whatever reason, school is not proving useful to her. Yet the criminalization of exit from school takes education fascism to a whole new level. The complete absence of the mother’s perspective as well as any comments on potential causes of the lack of performance seem to render them as not significant in making such an assessment. Unfortunately, the largest, most unrepresented, powerless minority anywhere in the world is children. This development essentially turns the education system into a forced process – essentially turning “Right” To Education into imposed education. There is no indication that the mother has mistreated the child in any manner – an assumption I am making, since I assume that judge would not leave a child in the custody of an abusive parent. So the “crime” seems to be the exit from school alone. This is ominous and puts homeschooling single parents at tremendous risk and gives potentially abusive ex-spouses a weapon of threat even after legal separation. The Delhi High Court on Tuesday warned a mother of strict action and termed as a ‘criminal offence’ her withdrawing her child from school. Justice Manmohan asked the Delhi government to admit the 13-year-old girl child to a school in Green Park area by Sep 22 and also get her medically examined Wednesday. The woman’s ex-husband had moved the court after she withdrew their child from school. “It’s a criminal offence to withdraw a child from school. You committed an unpardonable act. I am not taking strict action. But if you withdraw the child again, I will take strict criminal action. I will be monitoring this matter,” the court told the mother. The court took into note that though the girl was 13 years old, she had only studied till Class 2 and was physically very weak. The court also sought a status report from the government on the admission and medical examination of the child by Sep 29, the next date of hearing. The court also said that under the Right to Free and Compulsory Education Act, it was mandatory for a child between six to 14 years to get education. Justice Manmohan left it to the discretion of the school principal to admit the girl in an appropriate class and asked to monitor her progress and “to give her extra facilities so that she can adjust in the class”. The Delhi government was also asked to monitor the case. Three advocates were also appointed as amicus curiae to assist the court. Dharmendra Kapoor, father of the girl child, told the court that his ex-wife withdrew their child from the Green Field School and did not send her to any other school. Kapoor said he had admitted their child in DPS Sushant Lok, Gurgaon, but his ex-wife took their daughter with her, while leaving their home after divorce. This entry was posted in RTE News on September 16, 2014 by vidyut. 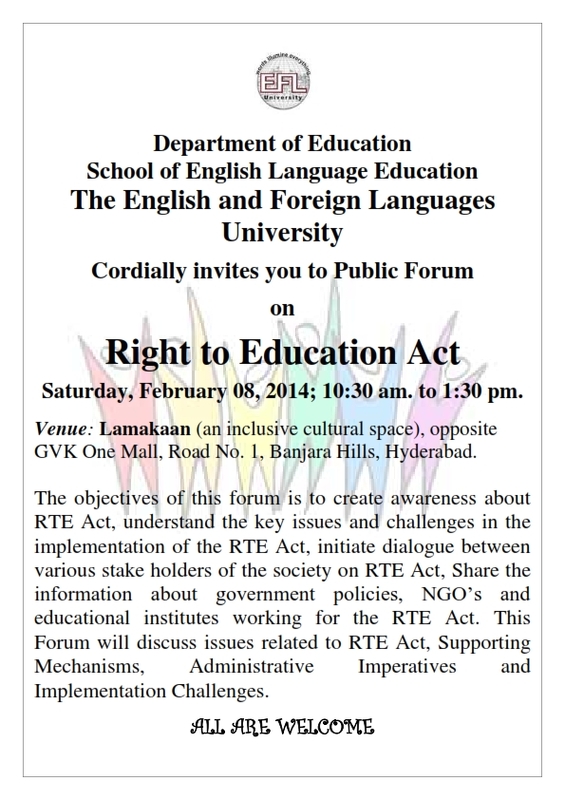 Mohammed Kalimullah, a Ph D scholar from the Department of Education; EFL University, Hyderabad had hosted an open forum on Right To Education Act at Lamakaan. The objectives of the forum were to create awareness about RTE Act, understand the key issues and challenges in the implementation of the RTE Act, initiate dialogue between various stake holders of the society on RTE Act, Share the information about government policies, NGO’s and educational institutes working for the RTE Act. The Forum discussed issues related to RTE Act, Supporting Mechanisms, Administrative Imperatives, and Implementation Challenges. Some of the stake holders invited to participate were Hon’ble Judge Mr. D. Durga Prasad, Principal Magistrate Juvenile justice Board, R.R. Dist; Mrs. Sunitha, Assistant professor, IASE, Osmania University; Dr. A Srinivas, Asst. Prof Polital Science, Kakatiya University; Venkateshwarlu Geriti, social worker Students for liberty; Mrs. P. Padmavathi, Member of CWC; Mr. K. Papi Reddy, State vice President (PRTU), Mr. M. Harish Mandal Resource person, Mahboob Nagar and many government and private teachers, principals, research Scholars from different Universities will participate in the forum discussion. 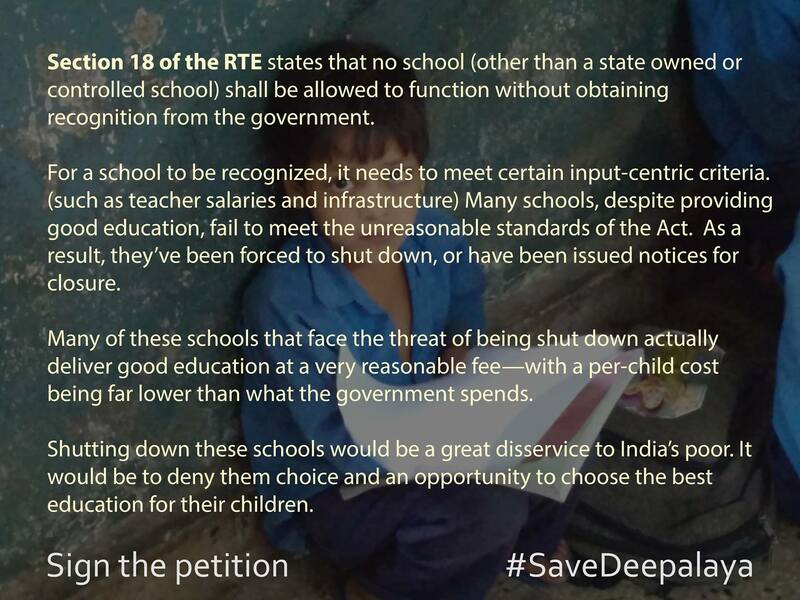 Could RTE make a difference in a child’s life and his education status after 3 years of implementation? Why is there indifference to its implementation? Why government schools have failed and lost faith of people? Why the present education system creating inequalities in children society and education system at large? Why is there exclusion of early childhood education from RTE Act? Why is there admission based on age but there is no facility for bridge courses before admission? Why is there no detention policy instead of improving the quality of education? Why the norms and standards specified in the schedule to the Act are excessively input focussed and do not ensure learning outcomes? What is the recognition process of state schools and teacher education colleges to meet the provisions of the Act “Quality education for all”? Why is there discrimination of students in implementing 25% reservation of seats in private schools? What are provisions for Orphans, Child labourers, Street children, School dropouts, out of school children in the Act and how much has been achieved in bringing these children in the mainstream of education? What does the Act say about the quality of teacher, teacher education and teacher pupil ratio? And what is the present situation? What are the major causes for mismatch between demand and supply factor in RTE Act? RTE Act designated National commission for Protection of Childs Rights to monitor the provisions of the Act but why is there no legal authority with NCPCR? Will common school system ensure quality education for all? Yugandhar, a home schooling parent from Hyderabad attended this forum, and here is his informal account from a perspective relevant to homeschoolers. I attended this session today. 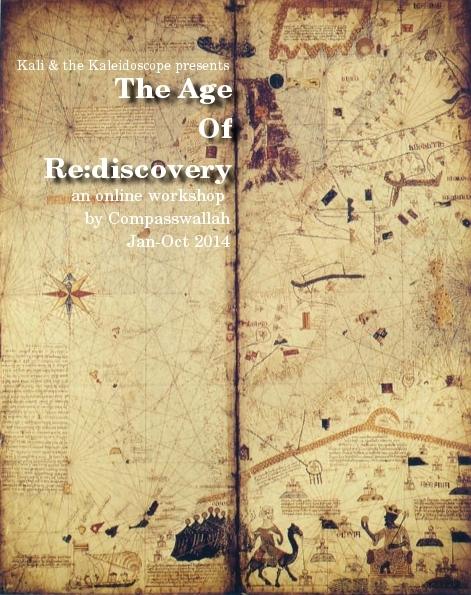 It was for about three hours by one research scholar Mr.kalimullah. I will try to capture in this mail what happened during those three hours and what part I played. The session started late by half an hour and Mr.K took another fifteen minutes to introduce the invited dignitaries and self-introduction of uninvited and unknown faces like me. Few professors, asst-professors, govt school teachers from neighboring districts, freelance writers, a few journalists, a private school principal, few youth leaders of student organisations, friends of Mr.K (mostly phd students ), founder of some NGO etc., totaling about 100 persons attended the session. Copies of the RTE act were distributed to everyone(luckily i didn’t print it yesterday 🙂 ). First the presenter went through all the inclusions in the act quickly and invited the main guests to present their views on the act. People expressed concerns about the known issues prevailing currently in schools like lack of sanitation for girls leading to drop outs after 6th standard or so, lack of pre-primary education system (anganwadi) being integrated with the primary school leading to poaching by private institutions( a student who joins in nursery/lkg etc in pre-primary will naturally go to a private institution), craze of parents to get their children english educated, improvement of transportation in villages leading to students going to pvt schools in nearby town, children taken away for 2 months for ag.work, lack of life skills leading t o suicides etc, definition of success, interest based learning, how rural people have to be ‘educated’ to send their children to school, flouting of RTE act by the cent.govt itself like conducting tests for admissions in Navodaya, and govt. schools getting the left over *material* (which is good for nothing), all children are not born equal and they must be supported as per their interests and skills etc. Teachers narrated how the act puts all the burden on the teachers and not on the parents and society at large. Many people were of the opinion that govt.schools had better skilled teachers than pvt.institutions, how the pupils of govt. schools are most equipped to handle life’s challenges, and how teaching in mother tongue is extremely important (as many a research proves), and many people narrated how they learnt english later in life etc. All in all, people were discussing about the ‘known’ issues and one person just touched on the *point 11* in the attached pic which is our point. He said that no body has any idea about it. Almost near the end, I took a chance to speak for around 5 minutes. I started by saying that there are families who are ‘out of school’ by choice due to various reasons. They are not against the school system per se, but they have some reservations with the system and chose to opt out. I mentioned about the case of shreya sahai, alternative learning spaces which do not conform to any standards of the RTE school definition but are doing excellent job of educating children, and how NIOS is under the axe. I mentioned about homeschooling and unschooling, the informal group of homeschooling families called swashikshan, the upcoming conference and asked the people to look up for these keywords in the internet for more information. I concluded that RTE does not have space for any alternative learning spaces, alternative methods of education and anything that is not mainstream. My talk was well received and few people followed up with me to know more. There was a man who is very much interested in HS abt his 4 year old daughter and knows few names and people in our circles (Aravinda, Sangeeta sriram, sailaja karanam etc). I talked to him for about 40 minutes. He was keen to know about the support that swashikshan extends. I explained to him about how we are totally informal group, and how people share their experiences and resources for any one who is seriously interested in HS. The presenter thanked me for bringing up a rather unknown aspect of education and learning. 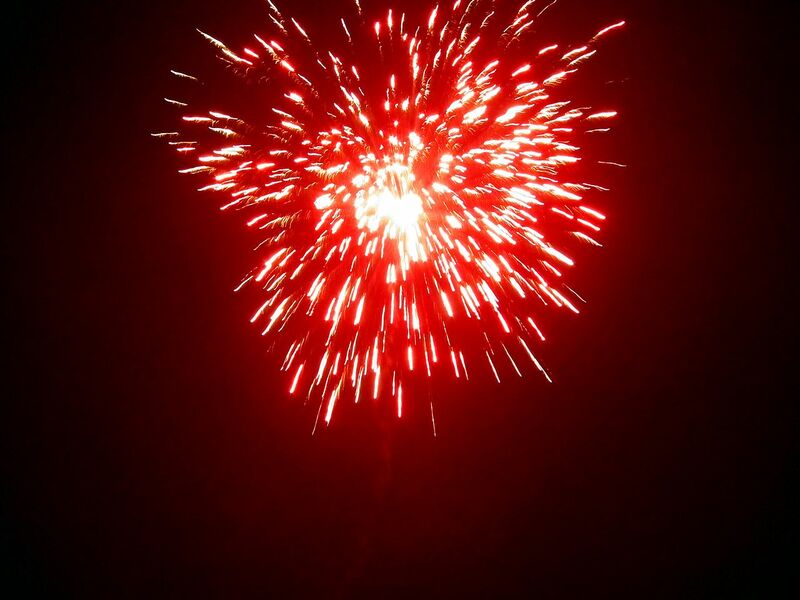 This entry was posted in Home Schooling News on February 12, 2014 by vidyut. Are homeschoolers in rural India already at risk from the education system? 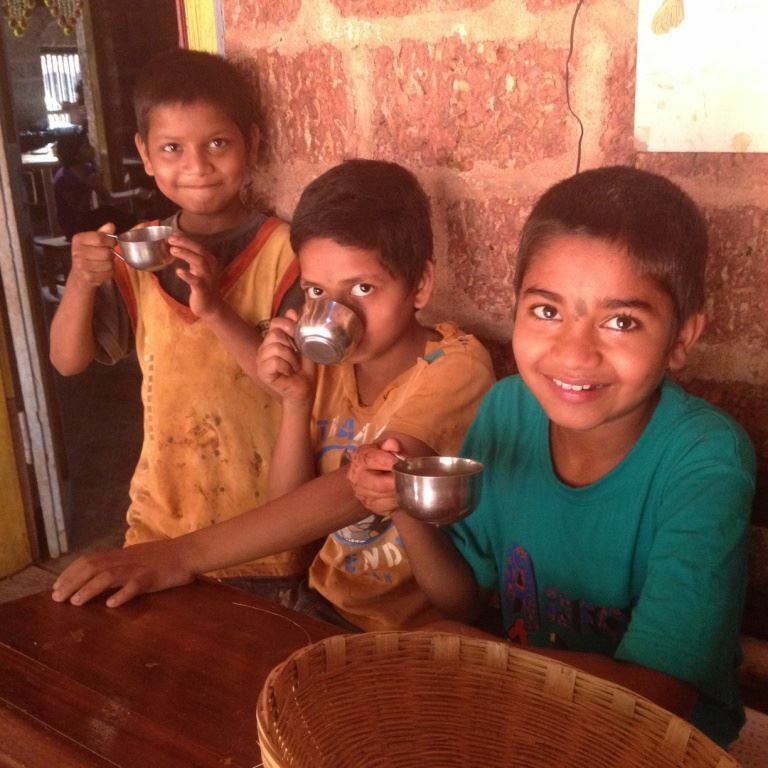 An Alarming letter from George Verghese on the homeschooling list indicates that the Anganwadi system in rural India may already be putting homeschooling children in the “RTE approved” education assembly line. We have been living on a farm near Sirsi, in the Western Ghats in Karnataka, for the last 7 years. 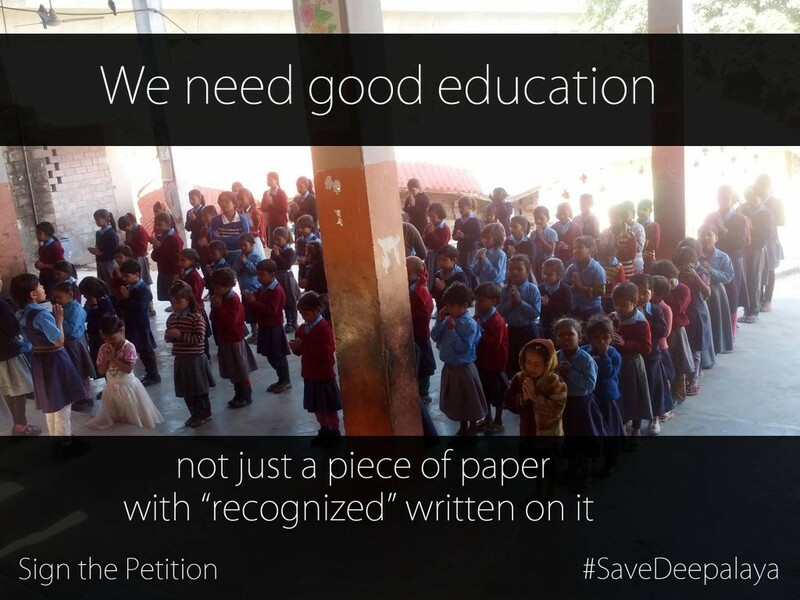 Our kids are unschooled and have never been to school. on and explain the existence of ‘dropouts’ in their regions to the higher-ups. So you’re either enrolled in any school or you’re a dropout. There’s nothing in between. We engaged them in a long conversation about the problems with the current school system and about why we chose to educate our kids ourselves. They were in agreement with the idea but they still had to figure out a way to account for our children that the system considered as ‘dropouts’. For the past few weeks, a few families in Sirsi and the surroundings have been meeting up every Wednesday evening to watch an education-related documentary and then have a discussion. This week, we happened to be hosting it. 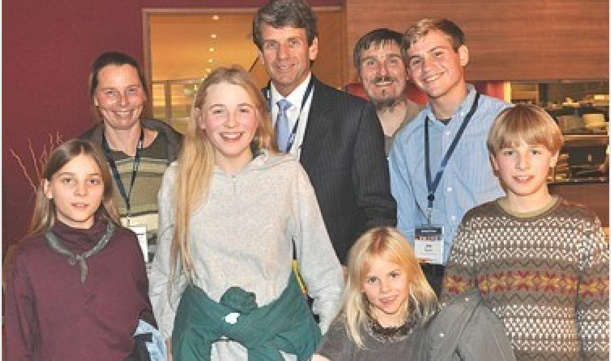 So we invited the officials to join us in the evening and meet a couple of other homeschooling families too. One of them (he was the most supportive about homeschooling) promised to attend, and he did come that evening with another colleague. We watched a documentary and then had a discussion in which they actively participated too. So that is where things stand now. But we are sure that we haven’t seen the end of this. Some higher official is bound to pursue the ‘dropouts’. So we’re steeling ourselves for the challenges ahead. So much for Kapil Sibal’s magnanimous reassurance that the law would ignore homeschoolers breaking it (yeah. Kapil Sibal had said it.) As George notes, this is a pause in the storm, because at the end of the day, the “status” of children is recognized only as “school” or “dropout” and the Sarkari machine will forever be hunting down the dropouts to get their enrollment statistics high enough to peddle in the next election campaign. Given that there is currently no legal sanction for homeschooling in India, this basically leaves parents to one of two choices – be hounded by the system over and over, or get out of the dead end by enrolling in some school. It is not the fault of the Anganwadi system either, which only works for the welfare of young children, and transfers them to the responsibility of the school when they grow out of their target age bracket. Indeed, it is astonishing that a school headmaster and education officials in a small village in the back of beyond have shown so much sympathy, though there is nothing they can do about the status of homeschooling itself not being supported by the system. Until there is recognition for homeschooling and children can be recorded as “homeschooling child” instead of “dropout from school”, this area of conflict with the system will remain, with the only solution being the “workaround corruption” that the official recommended – a token enrollment in some school to get the government off the child’s backs. I doubt this will come for free, and with children’s well being at stake, and deliberate violation of the law, it will be an area where parents will end up paying money to the school to “get their paperwork right” – the ultimate goal of Indian laws in order to protect their child from continued prejudice and parents from pressure to enroll. Is it not a sad result of a law designed to protect a child’s right to education? That a child getting customized education by parents who care enough to be illegal if that is what brings their child a responsive and supportive learning environment is considered deprived of the right to sit in a classroom everyday for years on end and being dictated to? This entry was posted in Home Schooling News on February 3, 2014 by vidyut. A homeschool family has been invaded, their homeschooled kids kidnapped by the state and court and their basic human rights trampled beyond recognition. Why? They were home schooling. With all the sensitivity of an elephant trampling through a nursery, the German Police invaded the Wunderlich home school classroom (not kidding, we’re talking battering ram, here) and forcibly took away their four homeschooled children between the ages of 7 and 14, informing the parents that they would never see them again. The homeschooled children were forcibly enrolled in a public school and allowed to return only when the desperate father agreed to continue sending them to school. Lawyers for the family had asked the judge to allow the parents to have custody because they had met all court demands for their children to go to public schools, and they wished to move to France, where homeschooling is legal. The judge, in his ruling, said that even though the Wunderlich children were academically proficient, well-adjusted socially and without educational deficiencies, he was horrified by homeschooling. Malkmus compared homeschooling to having the children wear a straitjacket and said he had to make sure the children remained in Germany so they would be integrated into society. Kidding you not. A Family Court judge acknowledges that the homeschooled children were well educated, but his horror is good enough reason to hold homeschooled kids hostage against a homeschooling family that won’t conform. Worse, the right of the homeschooling family to migrate to a place where they can homeschool legally in France has been stonewalled for no clear reason beyond “concrete endangerment to the wellbeing of the child”. While I am not one to ever dispute that parents have tremendous nuisance potential when it comes to endangering the well being of the child, it is not explained why the judge is saying this about homeschooled children who are “academically proficient, well-adjusted socially and without educational deficiencies” in his own estimation. It appears to be that the judge is prejudiced about this family. Worse, it is a judge in a court of law passing a judgment that holds a family separated and denied of the right to migrate to a place they wish to go to. Let this be a lesson to homeschool families in Germany. Get out of that place while you still can. Clearly the Nazis may have gone, but the intellectual fascists are thriving. This entry was posted in Uncategorized on February 2, 2014 by vidyut.